Our aim as your agent is not just to sell your home but also to sell it for the best possible price in the shortest period of time. As part of our plan to achieve this, we have put together this guide to successful selling. The information in this guide has been based on proven marketing techniques and will show you practical ways to prepare your property for sale. These ideas are simple and require the minimum of expense and time. First impressions count and are lasting. Potential buyers form an opinion of your property in the first 2- seconds. This is why it is vital to create the right look for your home. Keep your home tidy as much as possible, in particular at the front. It is sometimes worth redecorating, especially if it is long overdue and a quick freshen up in neutral colours will definitely be worthwhile. Creating an exciting and saleable interior can be accomplished at surpisingly little cost and by creating an inviting atmosphere it plays an important part in enhancing the purchaser's feel for your home. Open all the doors if you have a dark hallway or passage. Not letting in light to the property can make if feel a lot smaller. Fresh flowers can make the home look cheerful and fresh. If it is cold and dull, turn on the central heating and lights. If there is an open fire get that on as well. It will help create a homely and inviting atmosphere. If it is hot then open the windows, as fresh air is just as important. Smell has more impact that you might think. So avoid the smells buyers could find off-putting e.g., cigarette, damp and mildew, gas, pet odours and cooking oil. Ensure your kitchen is free from clutter . You want to give the impression it's a pleasure to work in. When showing your home try to avoid having too many people present as your potential buyer will feel like an uninvited guest and hurry through the property. Answer all their questions as best you can and point out any interesting features. Be polite but do not try to entertain your buyer. He or she wants to look over your home. It is not a social visit. Never apologise for the appearance of your home, after all it has been lived in. Be enthusiastic about the features but do not be over-zealous. If they appear to be genuinely interested encourage them to go around again, preferably on their own. If you have any pets please bear in mind that not all the potential purchasers will be animal lovers, so until you know how they will react, it will be better if they are kept out of the way. Pricing your home right in today's fluctuating market takes a real expert. Knowing what the house next door sold for simx months ago might have little bearing on your home's value today. A typical buyer spends months comparing homes in their price range. If you make the mistake of inflating the selling price of your home, in all likelihood it will not sell for more money - infact you'll probably sell it for less. Your best chance for getting the highest price for your home is to have it valued by an experienced estate agent who can set a fair market price for it. 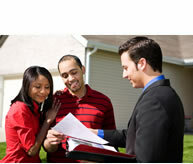 Your home will compete successfully with other properties on the market and will fetch the best price for you. You cannot change location, market conditions nor number and quality of competing homes.